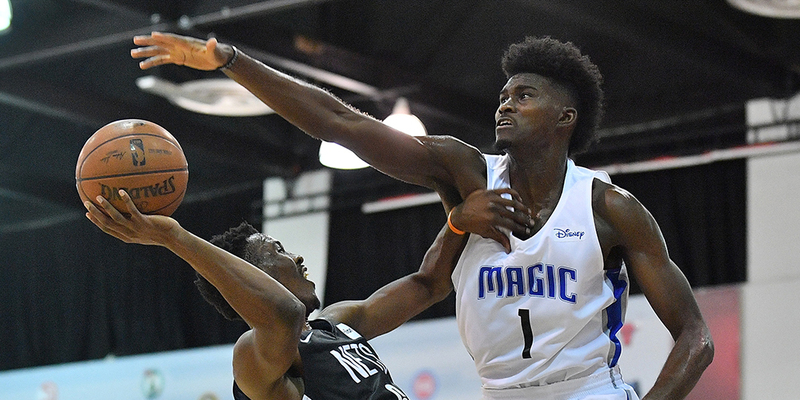 Jonathan Isaac's Summer League performance showcased his defensive strengths — but also showed how much growth he still needs to make on offense. Jonathan Isaac was the sixth pick in the 2017 draft, a lanky forward from Florida State who was raw but had the tools—scouts thought—to be a valuable player in the modern NBA. He had the size to play inside, the agility, shot and handle to play outside, and the length and lateral quickness to defend all over the court. After a difficult rookie season, Isaac averaged 19 points and 9 rebounds per 36 minutes in this year’s Las Vegas Summer League, and if some of the commentary coming out of Vegas was to be believed, Isaac’s performance suggested he is poised to become a star. But Summer League play needs to be evaluated carefully. It’s a different game in many ways, and to properly understand how performance in Summer League translates to the NBA, we have to understand the player we’re evaluating and what specifically we need to watch.